With 25 boats and 2 replicas, Crossfields of Arnside are one of most significant builders on the OGA Boat Register. Arnside is located in Cumbria at the top of Morecambe Bay on the Kent Estuary. Historically the estuary was the port for Kendal. Unusually for the North West Coast the area is wooded providing the source material for boat building. Crossfields were active from the 1840s to 1950s. Their heyday was the period leading up to the First World War from the 1890s. They were the leading builders of Morecambe Bay Prawners (or Lancashire Nobbies) serving an area from the North Wales coast to Southern Scotland. Lancashire Nobbies were fast gaff rigged fishing boat designed to cope with the shallow waters of the North West Coast, pull a heavy trawling net and get a perishable catch back to market as quickly as possible. Railways enabled the catch to be taken to the industrial towns of the North West fuelling the expansion of the fishing industry. Distinctive features of Morecambe Bay Prawners are the elliptical stern, central cockpit with a large deck area and low freeboard to facilitate the working of nets, high bows to cope with rough sea conditions, a large sail area and shallow draft. The boats are regularly raced in the Liverpool Nobby Race. There was crossover between the design of yachts and Nobbies. Around 25% of Crossfields output was yachts. They also built rowing boats, bay boats, and sailing dinghies, including Arthur Ransome’s Swallow. Bay boats were sailing boats used to take holidaymakers on excursions from resorts such as Morecambe. Yachts built by Crossfields include Ziska 1903, which has been sailed across the Atlantic and is now on the West Coast of America, Bonita 1888 the oldest boat to take part in 1913 OGA Round Britain Race, Moya 1910 and Molly both based in the Mediterranean. The first Crossfield to move to Arnside was John, who set up a village joinery business in the early nineteenth century. His younger son Francis developed the boat building side of the business, launching his first boat in 1838, whilst his elder brother Thomas concentrated on housing building. By the mid 1880s the business was being run by his sons William, Francis, John and George as Crossfield Brothers operating from the Top Shop yard on Church Hill. Boats were rolled down the hill to the shore and launched from the beach. 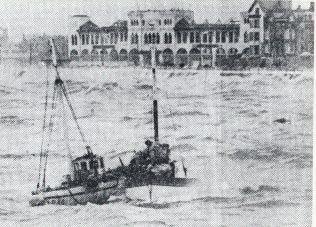 In 1892 William, the eldest son set up the Beach Walk Boatyard on the shore operating as William Crossfield and Sons taking his brother Francis with him. The Top Shop Boatyard continued to operate as Crossfield Brothers run by his half brothers John and George. In 1906 John moved to Conway opening a boat building business there that lasted till 1983. The Top Shop boatyard was then run by his younger brother George as George Crossfield and Sons. When George died in 1909 the name reverted to Crossfield Brothers run by his two sons. In 1915, they moved to Hoylake in the Wirral, the business lasting to the early 20s. The Top Shop Boatshed is still in existence but due to be demolished for two houses. The Beach Walk Boatyard continued to be operated by William’s sons till the early 1950s, though after the First World War, the demand for yachts and prawners declined. It was then run as Crossfields Successors, firstly by John Gill till 1966 and then John Duerden till 1983. The yard finally closed in the mid 1980s. The building has been unused ever since. Crossfield Successors made 13 of the West Kirby Hilbre Class. Conditions in the Boatyard were primitive with each plank of wood having to be sawn by hand. Working hours were limited to hours of daylight. It took four men 6 weeks or 120 working days to make a 32 foot prawner. It is said that the boats were made in silence with each man knowing what to do. Prior to the start of work, half models of the boats were made rather than plans. As well as making boats, Crossfields hired boats to holidaymakers, acted as village joiners and built coffins. In 2018 Arnside Sailing Club brought Severn, a Rivers Class yacht built by William Crossfield and Sons in 1912 in order to have an example of a Crossfield boat in the village with the help of a Heritage Lottery Grant. A Friends Group has been set up to help fund and maintain Severn. Article by Alasdair Simpson, Arnside Sailing Club. Reproduced from Old Gaffers Association Magazine, Summer 2018.